Kraft Food Inc.’s Wisconsin-based subsidiary Oscar Mayer has recently introduced ‘Lunchables with Fruit.’ This new variety of the Lunchables line now has a complete fruit serving included. 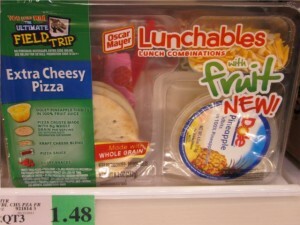 ‘Lunchables with Fruit’ is a new line of refrigerated products that includes one full serving of mandarin oranges or pineapple tidbits from Dole. This new product line has four varieties, namely Peanut Butter and Jelly Sandwich, Turkey plus Cheddar Crackers stackers, Extra-Cheesy Pizza and American Crackers Stackers plus Ham. These Lunchables varieties all contain crackers or bread that are made from whole grains. Part of this new product line’s introduction is a marketing campaign that has multiple platforms. It includes an advertisement campaign featuring eye-catching and colorful pictures of kids wearing smiles and glasses made from pineapple rings. The Lunchables marketing campaign team also started the campaign with a humanitarian activity in partnership with Feeding America. With this partnership, Oscar Mayer will donate up to a million pounds of fruit to families who have the most need. According to Lunchables’ Marketing Director, Joe Fragnito, the company continues to listen to its consumers and is committed to improving its Lunchables line. The company wants to make its lunch combination products a wholesome option for mothers, as well as a more enjoyable meal for kids. Fragnito added that fruit was the most requested item to be added for packed meals, such as packed lunches. This was the company’s answer to all those consumer requests. Fragnito also noted that the company wanted to make a fun campaign, one that was larger-than-life, in order to promote and celebrate this new and exciting product. ‘Lunchables with Fruit’ is now available in retail food stores all over the country with a retail price of $2.99 for every pack.